Storytelling is the act of telling a story in an entertaining, impressive or dramatic way. Telling is standing or sitting and using ones voice or sign language to present a story without reading from a book. We're all born storytellers and naturally use storytelling in one shape or other everyday - talking to neighbours, sharing secrets or gossip, recalling something dramatic, exciting or traumatic from our day. Sometimes we do it in an entertaining, or dramatic, or impressive way. Adding feeling or emotion is probably most important. How do we do it? Generally we remember the feeling of the event or imagine what our characters might be feeling and then adjust our 'delivery' accordingly. How do we adjust our delivery? The great thing about the ancient, oral tradition of storytelling is that the storyteller gets to change the words. Stories are constantly shaped and reshaped depending on the audience, the circumstances etc. Some tellers are very careful about their choice of words and some just let it flow naturally. Some follow old traditions, learning the story word for word, gesture for gesture, keeping the story 'pure'. Some change the words and the story line freely, adapting the story to fit the audience and the circumstance. For example, I have long and short versions of a number of my regular stories and not only choose between these, but often improvise entirely new sections if it seems appropriate. We can create our own style or copy from someone else's but our storytelling style will be a particular combination of all of the above. We all have a unique style of storytelling and usually a number of styles that we can draw on depending on the circumstances or venue. We might use one style while telling a tall story in a pub with the blokes, another during morning tea at a business meeting with a client, and a very different one while telling to fifty 5 year olds in a library. As you develop your skills you can decide to work on adding more of the above. This is an important and pleasurable aspect of storytelling. Those stories that we, and our audiences, enjoy are usually the ones that we tell again and again and that stay part of our repertoire. Inevitably we end up telling stories that are somehow part of our healing as individuals or as part of our culture or community. Don't worry about repeating stories. 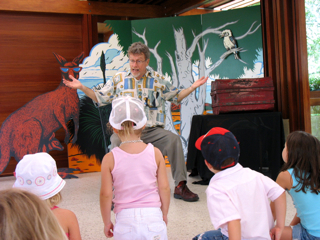 If you tell a story in an interesting and entertaining way audiences, especially young children, will enjoy hearing it again. This is one of the ways in which children learn. Each time they hear a story they will get something else out of it, learn something new. Be guided by whether or not you are enjoying telling the story and by the reaction of the audience. We can find stories by reading heaps - especially volumes of traditional folk tales from different countries or by listening to lots of stories. Stories come from our families and communities. Ask your parents and grandparents for the stories of their lives and retell them in ways that will be entertaining for your audiences. Our own lives are full of stories. Many of them are well worth telling. How do you pick which stories to tell? Well first of all, pick a story that makes you interested and curious about how it's going to end. Secondly, pick one that seems to 'flow off the pages of the book' into your speaking voice - a well rounded oral story not a 'hard' or literary story. Thirdly, pick a story, the philosophy of which, you can agree with, can be pleased with and proud of. The other good source of stories these days is off the Web. Just try any search engine for a term like folktales and have a look or join one of the email lists such as <storytellers@yahoogroups.com> where storytellers, and others such as writers, swap stories and discuss various aspects of storytelling. Easy peasy. Learn by putting the book down and telling your version to someone. Don't try to remember it word for word. Play around with it. Have fun with the story and you'll learn it easily. When you're happy with your version, tape record it and have a listen. How does it flow? Make some changes and try again. Now tell one or two stories you've learnt to an appropriate audience. Start with a small audience in a small, quiet venue. Take it easy and notice what the audience enjoyed and when they went to sleep or started fidgeting. Think how you might change the story/s and/or your telling of it so that the audience will enjoy even more of it. Changing a story is fine. It's part of the oral tradition. Tell it again and take notice of your audience reaction again. Did you enjoy telling it this time? If you did, then the story is probably worth some more work. Did you enjoy telling to that type of audience? If not why not? It could be the age group or the venue. Think of a way to tell to another age group. The biggest differences between age groups is the type of story they will like and how much they will join in with you. If you have a local storytelling group or guild then that's the perfect place to try stories out. Let the group know This is a story I'm learning to tell for preschool audiences. Notice how the audience reacts. Afterwards ask someone who looks friendly for some gentle feedback about it. What worked? What did they like? If you get some supportive answers you might try - How do you think I might improve my telling of it?" Take all of this feedback with a grain of salt however. Everyone is just so different when it comes to personal preferences and style. What works for one teller might not work for another. Refining your skills is a matter of gathering feedback, trying different things and practicing. People aren't born with a gift for storytelling. We learn the skills just like any other artform. 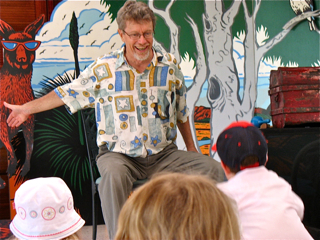 Other storytellers can pass on many skills in their workshops. Workshops, classes and courses provide structured ways of learning and practicing. If you would like a class or workshop in your area my Bringing Stories Alive workshop is a good starting point. You can go on learning the art of storytelling for many enjoyable years getting better and better all of the time. A good way to acquire some new skills is by listening to other storytellers. There is something to be learnt from every performer. What are they doing well? What did the audience like? What didn't work? The other thing is to develop good relationships with other storytellers. Tell other tellers what you like about their work and they'll start telling you as well. Take chances. Be generous. © 1998 Daryll Bellingham. One copy of the above notes are available for your personal use for developing your storytelling skills. If you would like to copy them or publish whole or in part please seek my permission. Last updated: 1st July, 2010.